Despite thymic involution, the number of naive CD4+ T cells diminishes slowly during aging, suggesting considerable peripheral homeostatic expansion of these cells. To investigate the mechanisms behind, and consequences of, naive CD4+ T cell homeostasis, we evaluated the age-dependent dynamics of the naive CD4+ T cell subsets CD45RA+CD31+ and CD45RA+CD31−. Using both a cross-sectional and longitudinal study design, we measured the relative proportion of both subsets in individuals ranging from 22 to 73 years of age and quantified TCR excision circle content within those subsets as an indicator of proliferative history. Our findings demonstrate that waning thymic output results in a decrease in CD45RA+CD31+ naive CD4+ T cells over time, although we noted considerable individual variability in the kinetics of this change. In contrast, there was no significant decline in the CD45RA+CD31− naive CD4+ T cell subset due to extensive peripheral proliferation. Our longitudinal data are the first to demonstrate that the CD45RA+CD31+CD4+ subset also undergoes some in vivo proliferation without immediate loss of CD31, resulting in an accumulation of CD45RA+CD31+ proliferative offspring. Aging was associated with telomere shortening within both subsets, raising the possibility that accumulation of proliferative offspring contributes to senescence of the naive CD4+ T cell compartment in the elderly. In contrast, we observed retention of clonal TCR diversity despite peripheral expansion, although this analysis did not include individuals over 65 years of age. Our results provide insight into naive CD4+ T cell homeostasis during aging that can be used to better understand the mechanisms that may contribute to immunosenescence within this compartment. Thymic involution begins ∼1 year after birth (1, 2), yet, despite this decrease in functional thymic volume, the proportion of peripheral phenotypically naive CD4+ T cells is relatively maintained throughout adulthood (3). Two mechanisms are believed to contribute to this observed homeostasis during aging: continued thymic output of newly generated T cells and extrathymic expansion of existing naive T cells in the periphery. We (3, 4), and others (5, 6), have previously demonstrated that despite thymic involution, new T lymphocytes continue to emigrate from the thymus well into adulthood, albeit at lower numbers than observed in prepubescent children. This has been shown by direct visualization and functional studies of thymocytes taken from adult thymic tissue (4, 5, 6), as well as the detection of TCR excision circles (TRECs)3 in the peripheral blood of the elderly (3). That the adult thymus retains the capacity to generate new T cells is perhaps best illustrated by studies demonstrating an increase in TREC content in the peripheral CD4+ T cell compartment during highly active anti-retroviral therapy for HIV disease and following bone marrow transplantation into adults (7, 8, 9, 10, 11, 12). The naive CD4+ T cell pool is also maintained through expansion of existing CD4+ T cells in the periphery. Peripheral expansion can be evidenced by the large reduction in TREC content in the naive CD4+ T cell pool during aging (3, 13). Although the mechanism by which peripheral expansion occurs is not entirely elucidated, in vivo murine studies have pointed to low-affinity TCR binding as a potential inducer of naive T cell replication (14, 15, 16), and in vitro human studies have found that IL-7 and various other cytokines can stimulate naive T cell division without loss of naive phenotype (17, 18, 19). These two mechanisms of naive T cell renewal, and the relative contribution of each, may have very different implications for the functional potential of the naive T cell pool. It has been suggested that negative immunologic sequelae observed in the elderly population, such as contraction of the TCR Vβ repertoire, attenuated cytokine production, decreased ability to provide B cell help, and increased apoptosis, are, in part, the result of long-term peripheral expansion (20, 21, 22, 23, 24, 25, 26, 27). This immunologic senescence may explain the observed increased risk of infection and decreased vaccination efficacy seen in older adults. Despite the important health implications, there is a paucity of knowledge regarding the dynamics of CD4+ T cell homeostasis and the relative contributions of thymic ouput and peripheral expansion to the naive T cell pool. These studies have been hindered by the lack of a reliable marker to distinguish thymus-derived and peripherally expanded naive CD4+ T cells. It has been known for some time that four subsets of CD4+ T cells, two of which are naive, can be distinguished by CD31 (PECAM-1) expression (28, 29, 30, 31). Those expressing both CD45RA and CD31 were found to have significantly more TREC than those expressing CD45RA, but lacking CD31 (32). Our aim was to explore the age-related dynamics of naive CD4+ T cell homeostasis and attempt to quantify the relative contribution of thymic output and peripheral expansion to the naive CD4+ T cell repertoire. Specifically, we examined the four CD4+ T cell subsets defined by CD45RA and CD31 expression and their subsequent change in percentage and TREC content during aging in a cross-sectional and longitudinal cohort. Furthermore, we examined telomere lengths to validate proliferative history and potential cellular senescence. TCR diversity was examined within these subsets to evaluate clonal heterogeneity, or loss thereof, through age-related peripheral expansion. Our results indicate an age-dependent decrease in CD45RA+CD31+ cells with an increasing reliance on peripherally expanded naive CD4+CD45RA+CD31− T cells. Despite this general trend, there is large interindividual variability in the relative contributions of thymus-derived, and peripherally derived, cells as components of the naive compartment. Longitudinal trajectories indicate a dynamic process as opposed to a linear change in cell subset percentages. Furthermore, there is a large variability in TREC content within the thymus-derived subset, and we show a decrease in TREC content with age, suggesting ongoing proliferation within this recent thymic emigrant-enriched subset. Taken together, our findings highlight the average increased reliance on peripherally derived cells to maintain the naive cell compartment. We also show that this process is dynamic within individuals and may not be exclusive to the CD45RA+CD31− compartment, as indicated by loss of TREC and shortened telomeres in both subsets. The high degree of observed variability implies the potential for identifying new predictors of differential immunologic outcomes and understanding of the mechanisms that may contribute to immunosenescence. Twenty-seven heterosexual participants, mostly males (81%) and ranging in age from 22 to 64 years old with a mean age of 41 ± 13, were evaluated at only one time point. Absolute counts were measured from cross-sectional participants only. For the longitudinal study, cryopreserved samples were obtained from 13 HIV-uninfected men enrolled in the Multicenter AIDS Cohort Study. The Multicenter AIDS Cohort Study is a large cohort study of homosexual and bisexual, primarily white, men evaluated every 6 mo since 1983. The specifics of the Multicenter AIDS Cohort Study have already been described in detail (33). We have previously shown a higher prevalence of hepatitis B virus and HSV-2 infection in seronegative men in the Multicenter AIDS Cohort Study as compared with healthy blood bank eligible controls (34). However, no statistical differences in CMV or HSV-1 infection were noted in that study. The participants for the longitudinal study were chosen for those with the longest duration of follow-up and number of available time points with sufficient sample. The average age of the longitudinal participants at the first chosen Multicenter AIDS Cohort Study visit (baseline) was 41 ± 14 with a range of 21–57 years of age and an average observation time of 16 ± 4 years. Thirteen participants with a total of 51 follow-up time points were used for flow cytometric analysis. Of these, nine participants with 33 time points had sufficient sorted sample for TREC quantification. In an effort to conserve samples, total sorted CD4+ T cells were analyzed for only six individuals at 22 time points. We were unable to evaluate TREC in the CD45RA+CD31− subset due to limited cell numbers. Blood was collected into EDTA-treated vacutainer tubes (BD Biosciences). Whole blood was stained with the following mAbs: CD45RA FITC, CD4 PerCP, CD31 PE, and CD28 and/or CD27 allophycocyanin (BD Immunocytometry Systems). Samples were stained, lysed, and analyzed according to the whole blood staining procedure, as described (35). Cryopreserved PBMC used for longitudinal data were collected in heparin, thawed, and then stained, as described for blood, with the exception that cells were not lysed, but were washed twice in 1 ml of 1 × PBS containing 2% newborn calf serum and 0.1% sodium azide. To aid in establishing a viable lymphocyte gate for PBMC, an additional tube stained with 7-aminoactinomycin D was used. Samples were analyzed using a FACSCalibur flow cytometer (BD Immunocytometry Systems) equipped with a 15 mW air-cooled 488 nm argon-ion laser and a red diode laser focused at ∼635 nm. For each sample, a minimum of 5000 CD4+ lymphocytes was collected. Analysis of the data was performed with CellQuest software (BD Immunocytometry Systems). Cell sorting was performed on a FACSAria flow cytometer (BD Immunocytometry Systems). A singlet gate of side scatter height vs side scatter width was used in addition to the standard forward scatter area vs side scatter area gating to exclude cell doublets and improve purity. PBMC, both freshly isolated and cryopreserved, were stained with CD45RA FITC, CD31 PE, CD4 allophycocyanin, and CD8 allophycocyanin-CY7 for the cell sorting and subsequent analysis of TREC and for telomere length. The CD4 purities were all >99% pure, and the subsets within CD4 were >95% pure. Genomic DNA was extracted from PBMC using the DNeasy Tissue Kit, according to manufacturer’s instructions (Qiagen). Real-time PCR was performed on a total of 5 ng of DNA per sample using iQ Sybr Green Supermix (Bio-Rad) and a previously published telomere quantitative PCR protocol (36). Genomic DNA extracted from a B lymphoblastoid cell line and from 1301 cells, a T cell leukemia cell line known for having extremely long telomere lengths (>25 kb) (37), was included in each PCR to control for interassay variation. A no-template control was included in all PCR, and all samples are expressed as a percentage of the telomere length of the 1301 cells. TCR Vβ CDR3 length mapping was performed using a multiplexed RT-PCR protocol, as previously described (38). Briefly, cell subsets were sorted from freshly separated or cryopreserved PBMC and suspended in TriReagent (Sigma-Aldrich) from which RNA was extracted. TCR Vβ transcripts were reverse transcribed using a C region primer, followed by Vβ-specific PCR consisting of multiplexed amplification using up to three specific primers and one fluorescently labeled (6-Fam, Tet, or Hex) reverse primer specific for the TCRβ C region. This method allows for the simultaneous amplification of 24 different Vβ families separated by size and fluorescence. A 310 Genetic Analyzer (Applied Biosystems) was used to collect fluorescence and size data, which were analyzed using Genescan and Genotyper software packages (Applied Biosystems). T cell Vβ CDR3 length expansions were analyzed with a modification of our previously described method (38). Briefly, all measured CDR3 length peak areas were summed for each Vβ family to yield a total area. The proportion of this area contributed by each measured peak was then calculated and standardized by the median ratio to obtain an adjusted standardized proportion for each peak in the experimental set. Those peaks that exceeded 3 SDs above the mean values derived from 35 healthy donors were considered expanded. The number of expansions divided by the number of observed peaks yielded the expansion ratio, which was used in subsequent analyses. TREC concentration was assessed using a previously described real-time PCR protocol (39). Briefly, cell lysates from PBMC and sorted CD4+ T cell subsets were created by incubating each sample with 100 μg/ml proteinase K (Boehringer Ingelheim) for 1 h at 56°C. Proteinase was then inactivated by heating for 10 min at 95°C. TREC were quantified by real-time PCR analysis, using the 5′ nuclease (TaqMan) assay and the ABI Prism 7700 sequence detector system (PE Biosystems), as described by others (3). A 25-μl PCR mixture consisted of 5 μl of genomic DNA solution, 2.5 μl of 10× PCR buffer, 1.75 μl of 50 mM MgCl2, 1 μl of 5 mM deoxynucleoside triphosphates, 1 μl each of 12.5 pM forward and reverse primer and 1 μl of 5 μM probe (MegaBases), 0.25 μl of 10 μM ROX reference dye (Invitrogen Life Technologies), and 0.125 μl of platinum Taq polymerase. The TREC standard consisted of known concentrations (from 20/5 μl to 2 × 106/5 μl) of a plasmid containing an sjTREC fragment (provided by D. Douek, Vaccine Research Center, Bethesda, MD). Standard curves and unknown TREC concentrations were determined using the software supplied with the ABI 7700. All samples and controls were prepared in triplicate, with the mean being used for subsequent calculations. The number of cells in each test sample was determined using real-time PCR to amplify β-actin DNA sequences (Applied Biosystems) per the enclosed instructions. All TREC and their corresponding β-actin experiments were performed in triplicate on the same plate to reduce error. The mean value for each triplicate was used for further analysis. For the longitudinal cohort, because comparisons were to be made between visits for each sorted subset, each subset at all visits was run on the same plate, minimizing the interplate variability. All analyses, except where noted above, were conducted with SAS 8.2 or SAS 9.1 (SAS Institute) software. For all age-dichotomized comparisons, the two-sided Wilcoxon rank-sum test was used. Telomere-length comparisons between sorted subsets were done using Wilcoxon matched-pairs signed-ranks test. Spearman correlation coefficients were used (PROC CORR) to measure associations between continuous variables. For undetectable TREC, the lowest detectable value was substituted by dividing 20 (the smallest standard) by the number of cells present in the reaction as determined by β-actin concentration. Samples with <3 × 104 detected β-actin were not used in the analysis. Longitudinal data were analyzed by repeated measures mixed-effects regression modeling with SAS PROC Mixed with a random intercept. PROC Mixed was also used to determine the effect of subset on telomere length, the effect of dichotomous age category on telomere length, and the potential interaction between these two predictors. Aging is associated with only a small decrease in the percentage of cells expressing the naive marker CD45RA (3). Cross-sectional analysis revealed an age-related decrease in the percentage of CD4+CD45RA+ T cells from an average of 53% for 20- to 40-year-old participants, to an average of 45% for those over 40 years old (p = 0.22). When this loss was examined in our longitudinal cohort, we found that 0.3% of CD4+CD45RA+ T cells were lost per year (Fig. 1⇓A), consistent with our modeled expected decrease of 3.6% per decade (p = 0.003). There was no clear trend toward a loss in the absolute numbers of these cells with age (spearman ρ = −0.28, p = 0.31) (data not shown). For example, 20- to 40-year-old participants had an average of 479 CD4+CD45RA+ T cells/mm3 compared with 406 cells/mm3 for participants over 40 (p = 0.41). Examination of participants at the extremes of our age groups further illustrates this point: individuals 20–30 years old had an average of 449.28 cells/mm3 compared with those over 50 having 303 cells/mm3 (p = 0.23). TREC loss in the CD4+ T cell compartment occurs more rapidly than loss of CD45RA+ T cells. 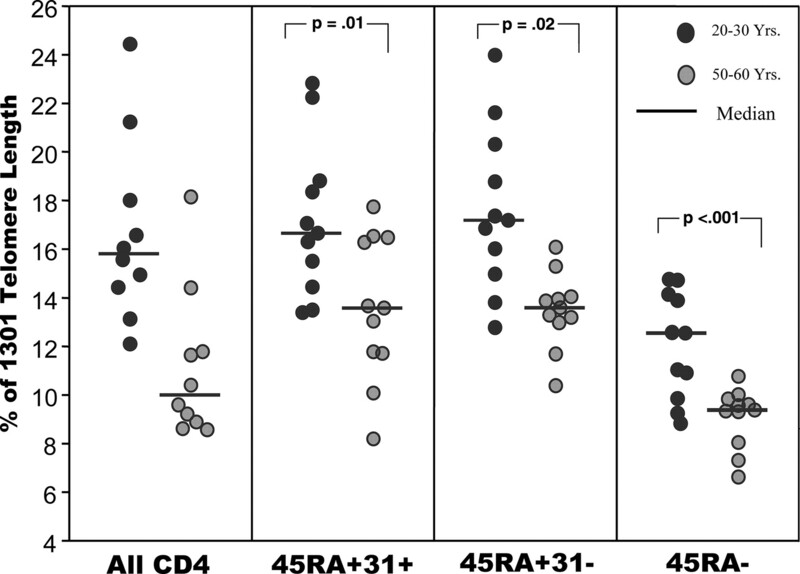 CD4+ T cells from the longitudinal cohort were evaluated over time for expression of CD45RA (A) or for TREC content (B). PBMC from individuals at the indicated ages (n = 13) were stained with anti-CD45RA Ab, and the percentage of positive cells was quantitated using flow cytometry. Each symbol and connecting line represents the result from one individual over time. The straight solid line represents the results from the repeated measures regression analysis. Total CD4+ T cells were sorted from the cryopreserved PBMC obtained from participants of the indicated ages (n = 6). TREC content was then evaluated using real-time PCR. Each symbol with a connecting line represents the values for one individual evaluated over time and is consistent for individuals between A and B. The straight solid line represents the results from the repeated measures regression analysis. Despite the relatively small decline in the percentage and absolute number of CD4+CD45RA+ T cells with increasing age, aging is strongly associated with declining TREC content in total CD4+ T cells (ρ = −0.64, p < 0.001) as previously reported (3) and shown in Fig. 1⇑B. We observed a 65% decrease in the TREC content of CD4+ T cells in individuals over 40 years of age as compared with the 20- to 40-year-old participants (1243 copies/105 cells vs 427 copies/105 cells, p = 0.005). Longitudinally, individuals lost an average of 3% of their baseline TREC content per year, ∼10 times greater than the observed average decrease in the percentage of CD45RA+CD4+. The repeated measures model yielded an expected average TREC loss of 168 copies per year (p < 0.0001). This discrepancy between CD4+CD45RA+ T cell maintenance and TREC loss suggests the accumulation of expanded CD4+CD45RA+ T cells with age. To better understand the disparity between the decline in TREC and the maintenance of the CD45RA+CD4+ T cells, we examined the age-related dynamics of the two CD4+ T cell subsets defined by CD45RA and CD31. Both the CD31+ and CD31− subsets of CD45RA+CD4+ T cells have been shown in other studies to be phenotypically and functionally naive (32, 40). We first confirmed the naive status of these cells by assessing CD27 and CD28 expression on total CD45RA+, CD45RA+CD31+, and CD45RA+CD31−CD4+ T cell subsets (Fig. 2⇓). On average, in individuals from the cross-sectional cohort, the CD27 (mean ± SD) expression on these naive T cell subsets was 97.7 ± 4.0, 98.0 ± 3.4, and 95.7 ± 8.6, respectively (n = 18), whereas CD28 expression was 98.0 ± 4.1, 98.2 ± 3.8, and 97.5 ± 5.0 (n = 23), respectively (Fig. 2⇓A). Both CD27 and CD28 are well-characterized surface Ags shown to be expressed on naive T cells and subsequently lost during the effector/memory stage (41). Neither marker is re-expressed on CD45RA+ terminally differentiated CD4+ T cells (42). To assess the impact of age on the extent of possible contamination of CD45RA+, CD45RA+CD31+, and CD45RA+CD31− subsets by terminally differentiated CD45RA+ T cells, we performed Wilcoxon signed-rank test to assess differences in the level of CD27 expression between seronegative men ≤30 years of age, n = 19, and ≥40 years, n = 18. The p values for this comparison were 0.078, 0.102, and 0.145, respectively, demonstrating minimal contamination of the naive CD45RA+CD31+ and CD45RA+CD31− subsets by terminally differentiated T cells. Phenotypic analysis of, and sorting strategies for, naive CD4+ T cell subsets defined by CD31. A, Fresh PBMC from a 29-year-old male were stained with CD45RA FITC, CD4 PerCP, CD31 PE, and CD28 allophycocyanin. 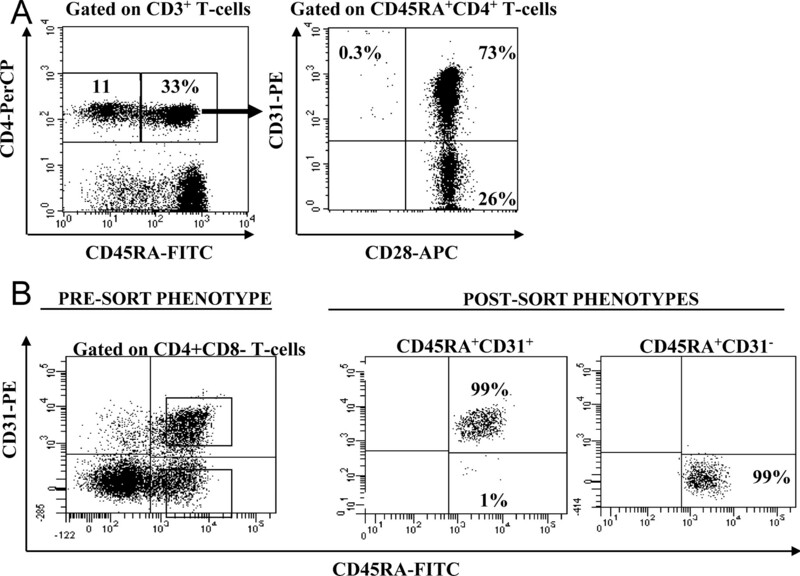 CD45RA+CD4+CD3+ T cells were gated and assessed for the expression of CD31 and CD28, as shown in the panel on the right. B, Fresh PBMC from a 60-year-old man were stained, as described above. The left-hand panel shows the gating strategy for sorting of CD45RA+CD31+CD4+ and CD45RA+CD31−CD4+ T cell subsets. The two panels on the right demonstrate the postsort purity from a representative sort. In our cross-sectional cohort, phenotypic analysis of CD4+ T cells from participants of various ages revealed that the proportion of CD4+CD45RA+CD31+ T cells decreased significantly with age (ρ = −0.49; p = 0.012) (Fig. 3⇓A). Absolute counts revealed a trend toward reduced numbers of these cells (ρ = −0.43; p = 0.11). Age-related dynamics of the naive CD4+ T cell subsets. The percentage of CD4+ T cells expressing both CD45RA and CD31 (A and B) or CD45RA, but not CD31 (C and D), was quantified using flow cytometry. A and C, Show results from the cross-sectional cohort, with each dot representing one individual at the indicated age (n = 26). The solid line is the result of a simple linear regression. B and D, Demonstrate data from the longitudinal cohort and illustrate the individual participant trajectories. Each symbol type represents one individual followed over time, with the solid line indicating the main effect of aging on percentage from the repeated measure analysis. E, TREC content was evaluated in the CD45RA+CD31−CD4+ T cell subset for the individuals in the cross-sectional cohort at the indicated ages (n = 23). Each point represents one individual, and the solid line depicts the result of a simple linear regression. Symbols are consistent for individuals depicted in B and D.
On average, 0.3% of CD45RA+CD31+CD4+ T cells were lost per year of follow-up in individuals within the longitudinal cohort (Fig. 3⇑B), and a modeled decline of 3.7% (p < 0.0001) for every 10 years of increasing age was calculated. These declines, comparable to those seen for the entire CD45RA+CD4+ naive T cell subset, imply that this subset alone accounts for observed decreases in the CD45RA+ naive cell compartment with aging. As can be seen in Fig. 3⇑B, whereas most of the individual trajectories for CD45RA+CD31+ cells sloped downward, there was a marked intraindividual variability in the magnitude of percentage of CD4+CD45RA+CD31+ T cells with aging; several individuals gained slightly in percentage (n = 3), whereas four participants experienced losses greater than 7% per year of follow-up. In contrast to the decline in CD4+CD45RA+CD31+ T cells, the percentage and absolute number of CD45RA+CD31− cells remained relatively stable with increasing age (ρ = 0.18; p = 0.38 and ρ = 0.32; p = 0.24, respectively) in both the cross-sectional and longitudinal cohorts (Fig. 3⇑, C and D, respectively), whereas the TREC content in this subset declined significantly (ρ = −0.68; p < 0.001) as measured in the cross-sectional cohort (Fig. 3⇑E). The maintenance of CD45RA+CD31− cell numbers and a decline in TREC content suggest that the loss of CD4+CD45RA+CD31+ T cells is partially offset by proliferation of the CD45RA+CD31− subset, slowing the overall decline of CD4+CD45RA+ T cells as individuals age. Although the CD45RA+CD31+ subset contained the highest concentration of TREC in every sample analyzed at any age, the overall average TREC content decreased during aging in this subset both in our cross-sectional (p = 0.05) and longitudinal analysis (p = 0.02) (Fig. 4⇓, A and B, respectively). However, this decrease was relatively small in contrast to the large decrease found in the expanding CD45RA+CD31− subset (Fig. 3⇑E). In the cross-sectional cohort, we detected an average TREC content of 7191 copies/105 CD45RA+CD31+ cells in participants under 40 years of age in contrast to 4807 copies/105 for those 40 years old or older (p = 0.04). In the longitudinal cohort, participants lost an average of 1.4% of their baseline TREC content per year between their first and last visits. These data imply some level of ongoing proliferation within this subset with accumulation of proliferative offspring, and further suggest that some level of proliferation can occur within the CD45RA+CD31+ subset in vivo without a concomitant loss of CD31. Decreases in TREC within the CD45RA+CD31+ subset with aging. Real-time PCR was used to determine the TREC concentration from sorted CD4+CD45RA+CD31+ cells from each cross-sectional (A), or longitudinal (B), participant at the indicated ages. A, Each symbol represents one individual in the cross-sectional cohort (n = 27). B, Each symbol type represents one individual in the longitudinal cohort followed over time, and the solid line indicates the main effect on percentage of aging from the repeated measure analysis. To further investigate our finding of proliferation of both naive subsets, and to better understand the impact of this proliferation over time, we sorted total CD4+, CD4+CD45RA+CD31+, CD4+CD45RA+CD31−, and CD4+CD45RA− T cells from 22 individuals, evenly divided into younger (ages 23–30) and older (ages 50–57) participants. We then analyzed the telomere lengths within each sorted subset using real-time PCR. As shown in Fig. 5⇓, both CD45RA+CD31+ and CD45RA+CD31− naive subsets had significantly longer telomere lengths than the CD45RA− effector/memory T cells (p < 0.0001) regardless of the participant’s age and the presence or absence of CD31. Within each age group, there was no difference between the telomere lengths of the CD45RA+ cells expressing CD31 and those not expressing CD31 (p = 0.74) despite greater proliferation within the CD31− subset. Both age and antigenic exposure are associated with decreased telomere length. PBMC from 22 participants in the cross-sectional cohort were sorted into four subsets as indicated and evaluated for telomere length using quantitative real-time PCR. Telomere lengths are shown as a percentage of control 1301 cells run in the same experiment. Telomere lengths in both of the naive CD4+ T cell subsets display shortening with age, implying a history of division, although telomeres are shortest in the memory subset. When younger and older age groups were compared, we observed that older participants had shorter telomeres in both the CD45RA+CD31− (p = 0.02) and TREC-enriched CD45RA+CD31+ subsets (p = 0.01) than younger participants (Fig. 5⇑). As expected, large differences were observed between telomere lengths in the memory subset (CD45RA−) between younger and older individuals (p = 0.0009). These data support our hypothesis drawn from the TREC results that aging is associated with an accumulation of proliferative offspring in both naive CD4+ T cell subsets, and imply that maintenance of the naive pool by proliferation may come at a biological cost. Although it is expected that some proliferation within the naive CD4+ T cell subsets is due to Ag-specific clonal responses, the extent of proliferation within the CD45RA+CD31− subset, and the concomitant decline in the numbers of CD45RA+CD31+ cells, suggests that proliferation within the CD45RA+CD31− subset is largely due to homeostatic signals. To test this hypothesis, we performed CDR3 length spectratyping on sorted CD4+ T cell subsets from six participants ranging in age from 23 to 53 years old (Fig. 6⇓). Although Ag-driven proliferation should skew the normally Gaussian-like TCR Vβ repertoire, retention of the TCR Vβ distribution more likely supports unbiased turnover due to homeostatic proliferation. CDR3-Vβ spectratyping shows relative preservation of clonality in both naive subsets. 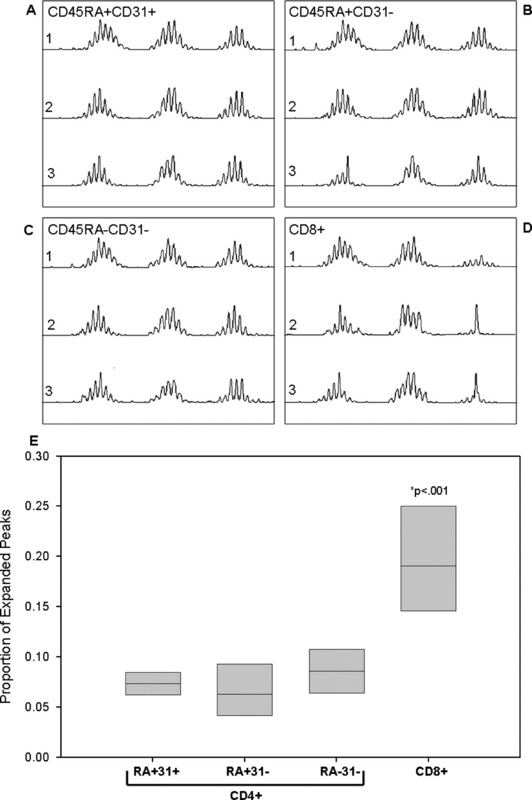 Sorted CD45RA+CD31+CD4+ (A), CD45RA+CD31− CD4+ (B), CD45RA−CD31−CD4+ (C), and total CD8+ (D) T cell subsets were subjected to TCR CDR3 spectratyping to examine clonal heterogeneity of TCR in six individuals of various ages. Results from three representative participants from the cross-sectional cohort are shown: participant 1, 23 years old; participant 2, 46 years old; and participant 3, 53 years old. TCR Vβ families 5.2, 13.1, and 22 are shown and were representative of the 24 TCR Vβ families measured. E, The proportion of expanded peaks quantified in each sorted cell subset is shown (n = 6 for CD4+ T cell subsets; n = 3 for CD8). The box plot depicts the 75th, 50th (median), and 25th percentiles of the distribution for each indicated subset. Repeated measures analysis was used to determine differences in expansion proportions between subsets. Using our previously published quantitative RT-PCR spectratyping protocol (38) on sorted naive CD4+ T cell subsets, we found that both of the naive subsets display a Gaussian-like distribution of CDR3 lengths well into adulthood (Fig. 6⇑). Although clonal heterogeneity would be expected in the thymic-derived naive T cells, we also found heterogeneity in the peripherally expanded CD45RA+CD31− cells, suggesting that accumulated proliferative offspring within this subset were generated by homeostatic proliferation rather than antigenic stimulation. This was in marked contrast to both CD4+CD45RA− effector memory T cells and CD8+ T cells collected from each individual and tested in parallel. The CD4+ effector/memory subset showed a moderately higher, although statistically insignificant, increase in expansions, whereas the CD8+ T cells showed evidence of selective expansion in participants across all observed ages (p < 0.001) and demonstrates the ability of our quantitative RT-PCR to detect clonal expansions (Fig. 6⇑E). We were unable to detect a significant loss of clonality in the CD4+CD45RA+CD31− subset with age up through at least 53 years old, the age of our oldest participant. Although our number of participants with TCR Vβ spectratyping data was insufficient to detect small differences in clonality, our data suggest that aging is not associated with severe contraction of the TCR Vβ repertoire through early and mid-adulthood, in contrast to another report (17). Although our observation of shortened telomeres in the naive CD4+ T cells suggests that upon Ag recognition, the subsequent clonal burst may be reduced, the retention of a Gaussian-like distribution of the TCR Vβ suggests that naive CD4+ T cells should be capable of recognizing a broad array of neo-Ags well into adulthood. Both homeostatic proliferation and thymic output have been proposed as mechanisms for the maintenance of the naive CD4+ T cell compartment during aging. Because these two mechanisms could have very different biological implications for the resulting naive T cells, we undertook both a cross-sectional and longitudinal assessment of the naive CD4+ T cell compartment during aging. Our results provide insight into the process of immunosenescence and demonstrate the individual variability of aging within this compartment. Consistent with the decline in thymic volume, we, and others (32, 43), found that aging is associated with a marked decrease in the proportion and absolute numbers of CD4+CD45RA+CD31+ T cells, the least differentiated of the two naive CD4+ T cell subsets. Our longitudinal data demonstrate tremendous variability in the rate of cell loss, suggesting that recruitment of naive T cells into the effector pool, and/or the rate of thymic output, varies widely between individuals. However, all individuals demonstrated a loss of cells from this subset, illustrating the inability of thymic output to sustain the naive CD4+ T cell pool in adults. Although the age-dependent decline of this subset implies limited proliferative tolerance, we are the first to demonstrate that cells within this subset can undergo some unknown number of proliferative events without the loss of the CD31 molecule, as evidenced by the decline in TREC within this subset during aging. In data not shown, we have confirmed that this decline in TREC could not have been due to the re-expression of CD31 on CD45RA+CD31− cells because only a very small percentage of purified CD45RA+CD31−CD4+ T cells re-expresses CD31 upon in vitro stimulation and the re-expressed CD31 was sufficiently dim to have excluded those cells from our sorting gates (data not shown). Conversely, CD45RA+CD31+CD4+ T cells stimulated in vitro can retain CD31 for up to three proliferative events, suggesting that the most reasonable explanation for our observed age-related decline in TREC is due to retention of proliferative offspring. This retention of proliferative progeny, although limited, complicates the assessment of thymic output in older adults, and therefore should be used only in conjunction with TREC to assess the status of this least differentiated of the naive CD4+ T cell subsets. In marked contrast to the CD4+CD45RA+CD31+ T cells, the CD45RA+CD31− subset is relatively maintained in both proportion and numbers during aging. A large age-dependent reduction in TREC was observed within this subset, suggesting continued turnover despite preservation of a naive phenotype. These observations support the contention of Kohler et al. (43) that peripheral expansion of CD45RA+CD31− cells is critical for maintaining the naive CD4+ T cell pool during aging. Our finding that the TCR Vβ distribution within the CD45RA+CD31− subset remains diverse well into adulthood further supports the hypothesis that proliferation of these cells is driven by homeostatic signals, most likely in response to the declining numbers of thymic-derived CD45RA+CD31+ cells during aging. Maintaining diversity within the TCR Vβ repertoire of naive CD4+ T cells is important in that it ensures the ability of the host to mount immune responses to a diverse array of neo-Ags. Indeed, other studies have suggested that contraction of the TCR Vβ repertoire within naive CD4+ T cells may be one mechanism contributing to the observed decreased immune responsiveness to vaccines and increased susceptibility to infectious diseases with advancing age (44, 45, 46). However, our results suggest that within the first six decades of life, heterogeneity of the TCR Vβ repertoire is maintained within the naive CD4+ T cell subset. Although our results are in direct contrast to Kohler et al. (43), who find strongly perturbed repertories in both naive CD4+ T cell subsets as early as 24 years of age, we did not examine TCR Vβ repertoires in the elderly, defined as ≥65 years of age, and we concede that the situation may be quite different at more advanced ages, as found by Naylor et al. (13). However, our results do suggest that aging is evident within the naive CD4+ T cell pool as early as the sixth decade of life per our observation of telomere shortening within both subsets of the naive CD4+ T cell compartment in our older study participants. Shortened telomeres are associated with diminished proliferative bursts (47) and are one of the hallmarks of senescent cells (48, 49), suggesting that naive CD4+ T cells from our older participants may be capable of binding a diverse array of neo-Ags, but they may not be capable of generating as many proliferative offspring as their younger counterparts. This could contribute to diminished immune capacity in the elderly by limiting the number of effector cells generated upon antigenic exposure. Although other studies have reported shortened telomeres within naive CD4+ T cells of the elderly (50), to our knowledge, this is the first study to demonstrate telomere shortening in the least differentiated naive subset of CD4+ T cells, the TREC-enriched CD45RA+CD31+ subset. Although there are several mechanisms that can contribute to telomere shortening, when taken together with the observed decreased TREC content within this subset, the shorter telomeres support our contention that this subset of naive of CD4+ T cells accumulates CD31+ proliferative progeny over time. Despite the fact that cell division might delay the numerical decline of the CD45RA+CD31+ subset, the shortened telomeres suggest that this proliferation comes at a biological cost to the aging host. The observed decrease in TREC content within the CD31−, as compared with the CD31+, subset was not associated with telomere length differences between these two subsets within individuals. This is not completely unexpected, given that, unlike TREC content, telomere length can be modulated in dividing lymphocytes, via telomerase up-regulation. One could speculate that the up-regulation of telomerase that occurs in proliferating CD31+ naive T cells early in life would minimize differences in telomere length between the two naive subsets, but is apparently not sufficient to maintain telomere lengths within these subsets during decades of proliferation. This notion is consistent with the loss in the ability of T cells to up-regulate telomerase following repeated rounds of cell division (51). Our data demonstrate that aging is associated with increased reliance on peripherally expanded naive CD4+ T cells with a diminution of TREC-enriched T cells expressing CD31. However, our longitudinal data clearly show that this process is highly variable and most likely due to the cumulative effect of a multitude of potential individual and environmental factors such as differential thymic output and one’s history of Ag exposures. Indeed, it has been shown that CMV seropositivity is associated with alterations of T cell function and of accelerated immune system aging (52), suggesting that an individual’s exposure to infectious agents may well determine the subsequent rate of immunologic aging. In turn, this observed variability may be a contributing explanation of the observed differential efficacy between an individual’s immune responses during aging. It will therefore be of interest to determine whether the individual variability we observed within the naive CD4+ T cell compartment is associated with differential immunologic sequelae and clinical outcomes. We thank all the study participants for their contributions to this work. We also thank Dr. Christel Uittenbogaart for careful reading of this manuscript and for her constructive comments. ↵1 This study was supported by National Institute of Allergy and Infectious Diseases Grants AI035040, AI037613, and AI058845 awarded to B.D.J. The longitudinal samples were obtained from the Multi-Center AIDS Cohort Study with centers located at: The Johns Hopkins Bloomberg School of Public Health (Joseph Margolick); Howard Brown Health Center and Northwestern University Medical School (John Phair); University of California, Los Angeles (Roger Detels); University of Pittsburgh (Charles Rinaldo); and Data Analysis Center (Lisa Jacobson). The Multicenter AIDS Cohort Study is funded by the National Institute of Allergy and Infectious Diseases, with additional supplemental funding from the National Cancer Institute and the National Heart, Lung, and Blood Institute: UO1-AI-35042, 5-M01-RR-00052 (GCRC), UO1-AI-35043, UO1-AI-37984, UO1-AI-35039, UO1-AI-35040, UO1-AI-37613, and UO1-AI-35041. ↵3 Abbreviation used in this paper: TREC, TCR excision circle. Aspinall, R., D. Andrew. 2000. Thymic involution in aging. J. Clin. Immunol. 20: 250-256. Flores, K. G., J. Li, G. D. Sempowski, B. F. Haynes, L. P. Hale. 1999. Analysis of the human thymic perivascular space during aging. J. Clin. Invest. 104: 1031-1039. Jamieson, B. D., D. C. Douek, S. Killian, L. E. Hultin, D. D. Scripture-Adams, J. V. Giorgi, D. Marelli, R. A. Koup, J. A. Zack. 1999. Generation of functional thymocytes in the human adult. Immunity 10: 569-575. Bertho, J. M., C. Demarquay, N. Moulian, M. A. Van Der, S. Berrih-Aknin, P. Gourmelon. 1997. Phenotypic and immunohistological analyses of the human adult thymus: evidence for an active thymus during adult life. Cell. Immunol. 179: 30-40. Poulin, J. F., M. N. Viswanathan, J. M. Harris, K. V. Komanduri, E. Wieder, N. Ringuette, M. Jenkins, J. M. McCune, R. P. Sekaly. 1999. Direct evidence for thymic function in adult humans. J. Exp. Med. 190: 479-486. Al Harthi, L., G. Marchetti, C. M. Steffens, J. Poulin, R. Sekaly, A. Landay. 2000. Detection of T cell receptor circles (TRECs) as biomarkers for de novo T cell synthesis using a quantitative polymerase chain reaction-enzyme linked immunosorbent assay (PCR-ELISA). J. Immunol. Methods 237: 187-197. Nobile, M., R. Correa, J. A. Borghans, C. D’Agostino, P. Schneider, R. J. de Boer, G. Pantaleo. 2004. De novo T-cell generation in patients at different ages and stages of HIV-1 disease. Blood 104: 470-477. Steffens, C. M., K. Y. Smith, A. Landay, S. Shott, A. Truckenbrod, M. Russert, L. Al Harthi. 2001. T cell receptor excision circle (TREC) content following maximum HIV suppression is equivalent in HIV-infected and HIV-uninfected individuals. AIDS 15: 1881-1882. Ye, P., A. P. Kourtis, D. E. Kirschner. 2003. Reconstitution of thymic function in HIV-1 patients treated with highly active antiretroviral therapy. Clin. Immunol. 106: 95-105. Zhang, L., S. R. Lewin, M. Markowitz, H. H. Lin, E. Skulsky, R. Karanicolas, Y. He, X. Jin, S. Tuttleton, M. Vesanen, et al 1999. Measuring recent thymic emigrants in blood of normal and HIV-1-infected individuals before and after effective therapy. J. Exp. Med. 190: 725-732. Naylor, K., G. Li, A. N. Vallejo, W. W. Lee, K. Koetz, E. Bryl, J. Witkowski, J. Fulbright, C. M. Weyand, J. J. Goronzy. 2005. The influence of age on T cell generation and TCR diversity. J. Immunol. 174: 7446-7452. Kieper, W. C., J. T. Burghardt, C. D. Surh. 2004. A role for TCR affinity in regulating naive T cell homeostasis. J. Immunol. 172: 40-44. Seddon, B., R. Zamoyska. 2003. Regulation of peripheral T-cell homeostasis by receptor signalling. Curr. Opin. Immunol. 15: 321-324. O’Neill, R. M., J. Hassan, D. J. Reen. 2003. IL-7-regulated homeostatic maintenance of recent thymic emigrants in association with caspase-mediated cell proliferation and apoptotic cell death. J. Immunol. 170: 4524-4531. Soares, M. V., N. J. Borthwick, M. K. Maini, G. Janossy, M. Salmon, A. N. Akbar. 1998. IL-7-dependent extrathymic expansion of CD45RA+ T cells enables preservation of a naive repertoire. J. Immunol. 161: 5909-5917. Aggarwal, S., S. Gupta. 1998. Increased apoptosis of T cell subsets in aging humans: altered expression of Fas (CD95), Fas ligand, Bcl-2, and Bax. J. Immunol. 160: 1627-1637. Donnini, A., F. Re, M. Bollettini, R. Moresi, S. Tesei, G. Bernardini, M. Provinciali. 2005. Age-related susceptibility of naive and memory CD4 T cells to apoptosis induced by IL-2 deprivation or PHA addition. Biogerontology 6: 193-204. Haynes, L.. 2005. 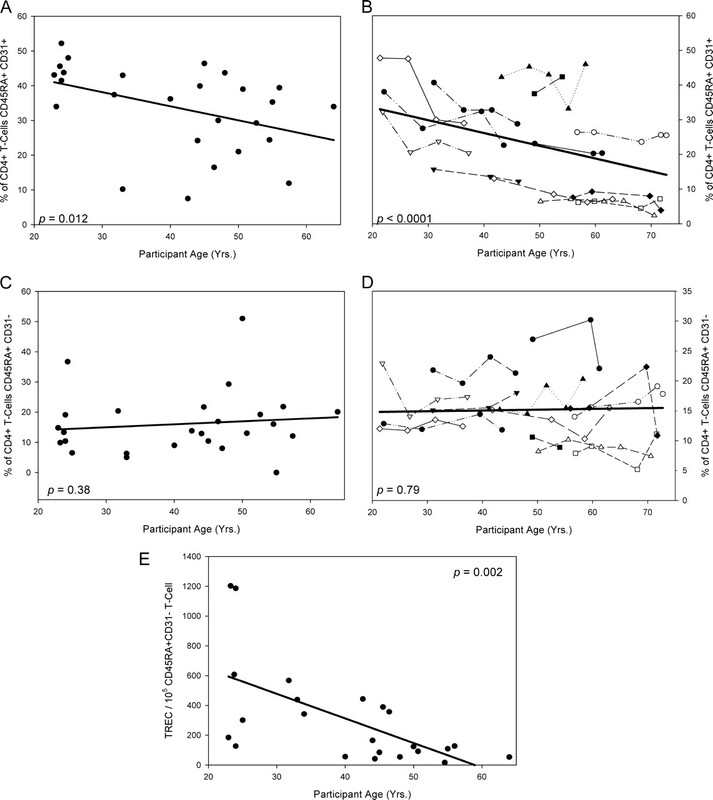 The effect of aging on cognate function and development of immune memory. Curr. Opin. Immunol. 17: 476-479. Linton, P. J., L. Haynes, N. R. Klinman, S. L. Swain. 1996. Antigen-independent changes in naive CD4 T cells with aging. J. Exp. Med. 184: 1891-1900. Miller, R. A.. 2000. Effect of aging on T lymphocyte activation. Vaccine 18: 1654-1660. Schindowski, K., L. Frohlich, K. Maurer, W. E. Muller, A. Eckert. 2002. Age-related impairment of human T lymphocytes’ activation: specific differences between CD4+ and CD8+ subsets. Mech. Ageing Dev. 123: 375-390. Swain, S., K. Clise-Dwyer, L. Haynes. 2005. Homeostasis and the age-associated defect of CD4 T cells. Semin. Immunol. 17: 370-377. Stockinger, H., W. Schreiber, O. Majdic, W. Holter, D. Maurer, W. Knapp. 1992. Phenotype of human T cells expressing CD31, a molecule of the immunoglobulin supergene family. Immunology 75: 53-58. Torimoto, Y., D. M. Rothstein, N. H. Dang, S. F. Schlossman, C. Morimoto. 1992. CD31, a novel cell surface marker for CD4 cells of suppressor lineage, unaltered by state of activation. J. Immunol. 148: 388-396. Hamann, D., P. A. Baars, B. Hooibrink, R. W. van Lier. 1996. Heterogeneity of the human CD4+ T-cell population: two distinct CD4+ T-cell subsets characterized by coexpression of CD45RA and CD45RO isoforms. Blood 88: 3513-3521. Thiel, A., J. Schmitz, S. Miltenyi, A. Radbruch. 1997. CD45RA-expressing memory/effector Th cells committed to production of interferon-γ lack expression of CD31. Immunol. Lett. 57: 189-192. Detels, R., A. Munoz, G. McFarlane, L. A. Kingsley, J. B. Margolick, J. Giorgi, L. K. Schrager, J. P. Phair. 1998. Effectiveness of potent antiretroviral therapy on time to AIDS and death in men with known HIV infection duration: Multicenter AIDS Cohort Study Investigators. J. Am. Med. Assoc. 280: 1497-1503. Killian, M. S., J. Monteiro, J. Matud, L. E. Hultin, M. A. Hausner, O. O. Yang, P. K. Gregersen, R. Detels, J. V. Giorgi, B. D. Jamieson. 2004. Persistent alterations in the T-cell repertoires of HIV-1-infected and at-risk uninfected men. AIDS 18: 161-170. Hultin, L., P. Hultin. 2006. Flow cytometry-based immunophenotyping method and applications. B. Detrick, and R. Hamilton, and J. Folds, eds. Manual of Molecular and Clinical Laboratory Immunology 147-157. ASM Press, Washington, D.C..
Hultdin, M., E. Gronlund, K. Norrback, E. Eriksson-Lindstrom, T. Just, G. Roos. 1998. Telomere analysis by fluorescence in situ hybridization and flow cytometry. Nucleic Acids Res. 26: 3651-3656. Killian, M. S., J. Matud, R. Detels, J. V. Giorgi, B. D. Jamieson. 2002. MaGiK method of T-cell receptor repertoire analysis. Clin. Diagn. Lab. Immunol. 9: 858-863. Pham, T., M. Belzer, J. A. Church, C. Kitchen, C. M. Wilson, S. D. Douglas, Y. Geng, M. Silva, R. M. Mitchell, P. Krogstad. 2003. Assessment of thymic activity in human immunodeficiency virus-negative and -positive adolescents by real-time PCR quantitation of T-cell receptor rearrangement excision circles. Clin. Diagn. Lab. Immunol. 10: 323-328. Messele, T., M. Abdulkadir, A. L. Fontanet, B. Petros, D. Hamann, M. Koot, M. T. Roos, P. T. Schellekens, F. Miedema, T. F. Rinke de Wit. 1999. Reduced naive and increased activated CD4 and CD8 cells in healthy adult Ethiopians compared with their Dutch counterparts. Clin. Exp. Immunol. 115: 443-450. Fallen, P. R., R. F. Duarte, L. McGreavey, M. Potter, M. Ethell, H. G. Prentice, J. A. Madrigal, P. J. Travers. 2003. Identification of non-naive CD4+CD45RA+ T cell subsets in adult allogeneic haematopoietic cell transplant recipients. Bone Marrow Transplant. 32: 609-616. Kohler, S., U. Wagner, M. Pierer, S. Kimmig, B. Oppmann, B. Mowes, K. Julke, C. Romagnani, A. Thiel. 2005. Post-thymic in vivo proliferation of naive CD4+ T cells constrains the TCR repertoire in healthy human adults. Eur. J. Immunol. 35: 1987-1994. Effros, R. B.. 2000. Long-term immunological memory against viruses. Mech. Ageing Dev. 121: 161-171. Webster, R. G.. 2000. Immunity to influenza in the elderly. Vaccine 18: 1686-1689. Herndler-Brandstetter, D., D. P. Cioca, B. Grubeck-Loebenstein. 2006. Immunizations in the elderly: do they live up to their promise?. Wien. Med. Wochenschr. 156: 130-141. Globerson, A., R. B. Effros. 2000. Ageing of lymphocytes and lymphocytes in the aged. Immunol. Today 21: 515-521. Roth, A., H. Yssel, J. Pene, E. A. Chavez, M. Schertzer, P. M. Lansdorp, H. Spits, R. M. Luiten. 2003. Telomerase levels control the lifespan of human T lymphocytes. Blood 102: 849-857. Effros, R. B.. 1998. Replicative senescence in the immune system: impact of the Hayflick limit on T-cell function in the elderly. Am. J. Hum. Genet. 62: 1003-1007. Pfister, G., D. Weiskopf, L. Lazurdi, R. D. Kovaiou, D. P. Cioca, M. Keller, B. Lorbeg, W. Parson, B. Grubeck-Loebenstein. 2006. Naive T cells in the elderly: are they still there?. Ann. NY Acad. Sci. 1067: 152-157. Weng, N., B. L. Levine, C. H. June, R. J. Hodes. 1997. Regulation of telomerase RNA template expression in human T lymphocyte development and activation. J. Immunol. 158: 3215-3220. Pawelec, G., S. Koch, C. Franceschi, A. Wikby. 2006. Human immunosenescence: does it have an infectious component?. Ann. NY Acad. Sci. 1067: 56-65.